To be fair, Drake being at Wimbledon did not ruin Serena Williams' tournament. She won the whole thing this summer. But then again, a Ferrari doesn't crash just because you used a vanilla air freshener instead of pine. Winning her sixth Wimbledon title was just another day on the job for one of the all-time greats. Today, however, a certain place in the history books was denied when Serena—a sure bet if there ever was one—lost her U.S. Open semifinal to the 43rd-ranked player in the world and was unable to complete the fourth-ever calendar-year singles Grand Slam for a female player or tie Stefi Graf for the most ever Grand Slam singles titles. And it is just too fun and convenient to blame her longtime friend and rumored new beau, Drake. Because Aubrey Drake Graham, people, is a big-time sports fan who has brushed paths with more than a few crushed hopes and dreams. Hometown Hurt: The Canadian star has served as a brand ambassador for his hometown Toronto Raptors and ended up getting the team fined $25,000 last year over a crack he made during a concert about Oklahoma City Thunder superstar Kevin Durant. "Before we leave, I just want to show one of my brothers something. You know, my brother Kevin Durant was kind enough to come to the show tonight and watch us. I just want him to see what would happen if he came to play in Toronto. Let him know what would happen." The NBA called foul, accusing the Raptors of "tampering," because of Drake's link to the team. In fact, the league offered to rescind the fine if they dumped the rapper, but the Raptors refused. They were also swept out of the playoffs at the end of the 2014-15 season by Washington. 2013 NBA Finals: Of course the Miami Heat—led by All-Stars LeBron James and Dwyane Wadewere going to repeat as NBA champions and of course Drake was along for the ride in support of buddy LeBron. Here he is during Game 7, which Miami won, after which Drake partied with the team and presumably toasted to making it a threepeat the following year. Or, the Heat could lose to the Spurs, 4-1, in 2014 and LeBron could take his talents back to Cleveland, either way. Buddies or Bust: Johnny Manziel was already a controversial superstar, known for his cocky, party-boy antics, when he was drafted by the Cleveland Browns out of Texas A&M in 2014. He and Drake became fast friends on the Hollywood scene and Manziel went on to have a completely lackluster rookie season in the pros. The oft-injured quarterback checked into treatment this past February (we're not, for the record, blaming his personal issues on Drake) and his still-supportive team has high hopes. And the expectations on Cleveland couldn't be much lower so...Drake is welcome whenever! March Madness 2014 & 2015: The honorary Wildcat spent some quality time with the favored-to-win-it-all University of Kentucky men's basketball team, taking shots with the team during practice and sitting front and center to watch their victory over Wisconsin in the Final Four. He was one of the first guests in the locker room to congratulate them on the big win, after which they lost to Florida. This year, after Kentucky's shocking upset at the hands of Wisconsin in the Final Four after going undefeated in the regular season, The Game later revealed that he and Drake had a $6,000 bet going on the game—and guess who won. 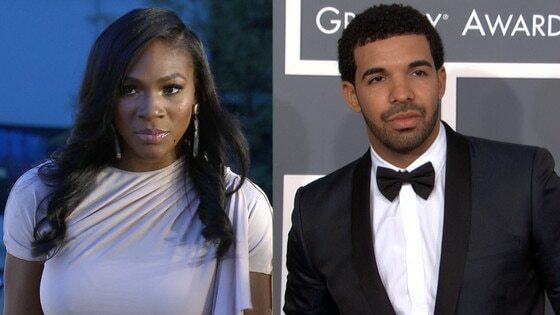 What's Going on With Drake and Serena Williams?